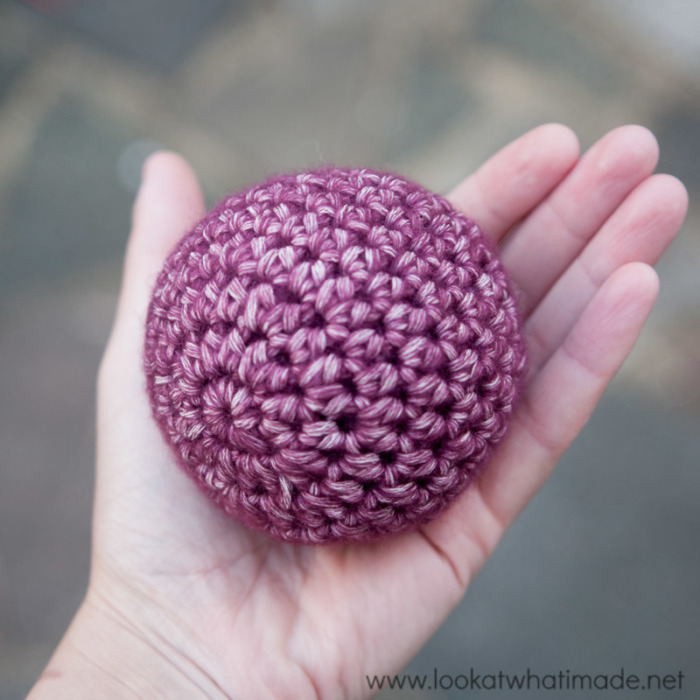 Crochet balls are incredibly versatile. You can make them tiny to use as beads for necklaces, or really big to use as pouffes. You can make small balls and large balls, heads for animals and tummies for teddies, Christmas baubles and accent pieces… Anything spherical your incredible mind can dream up. If you saw my Christmas Tree last week, you will have seen that it was topped with one of these crochet balls. Usually changing the size of a crochet sphere can be a bit tricky. The bigger it gets, the more maths go into making it round instead of oval. When I was working on Big Hook Rag Crochet, I figured out a way to keep the instructions the same, regardless of how big or small you want your balls to be. The secret is really simple: use hdc stitches! 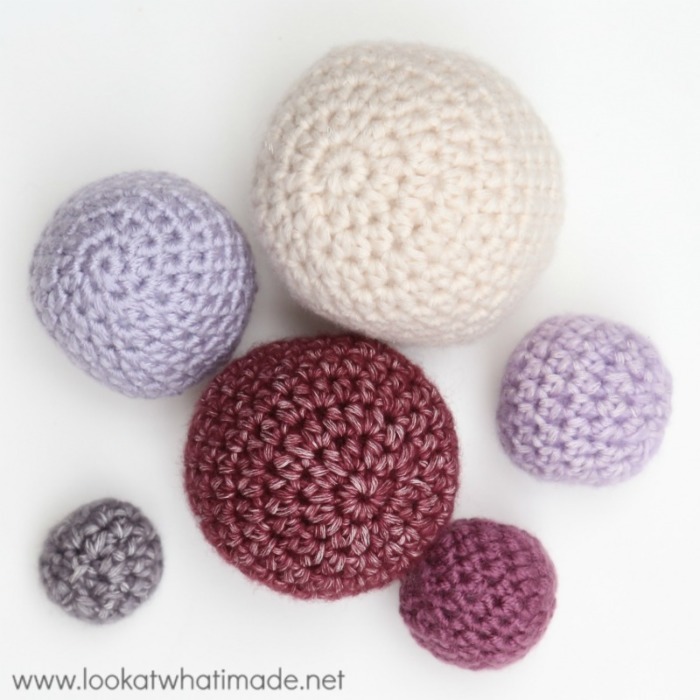 I have written a free pattern for these Crochet Balls. 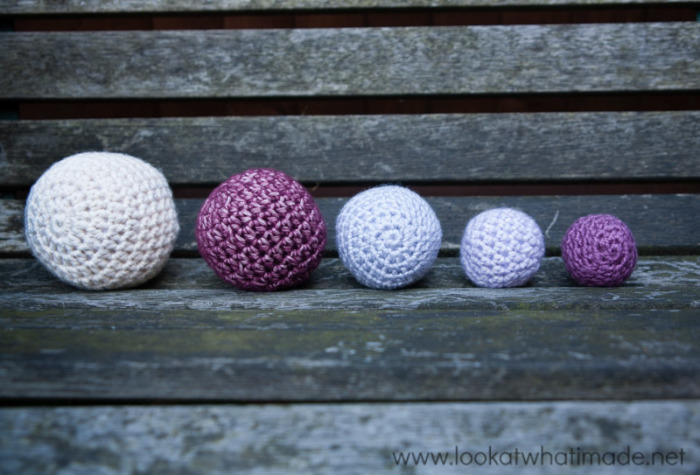 The pattern tells you how to make small crochet balls in 4 different sizes. It also explains how to create a ball of any size. You can find the Free pattern (and PDF) HERE on Craftsy. If you want to make balls with dark yarn, use scraps of black (or dark) t-shirt fabric to stuff you balls. Using dark stuffing like this will make the stuffing less visible. Alternatively you can use ‘Stuffing Bombs‘. Keep in mind that using cut-up fabric can give you a slightly warped ball if you don’t stuff your crochet ball well. 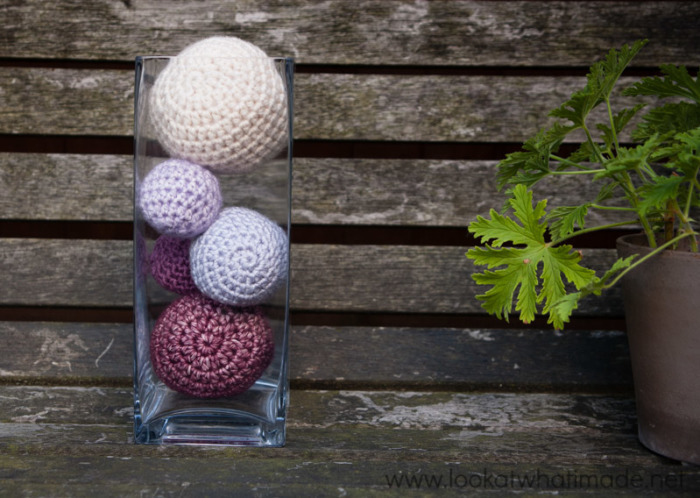 I am using my crochet balls as a pretty Room Freshener/Stress Reliever. I find that I have to re-spritz the balls about once a week to once every two weeks (depending on how lazy I am). We do also use an Essential Oil Diffuser, so sometimes I will just hold the balls over the steam for a bit to ‘refresh’ them. Hdc’s are great for creating crochet balls, but if you are making stuffed toys, you might want to use a more dense stitch like single crochet. My go-to source for single crochet balls is Ms Premise-Conclusion. Her balls are very aptly called ‘Ideal Crochet Spheres’. She also has an amazing tool for creating personalized spheres (in other words, spheres of any size). You just bob your numbers into the supplied tool and it magically creates a pattern for you. These would also be great to make covers for wooden or rubber beaters and mallets for percussion instruments. I like to have several different types of mallets for playing percussion – it’s not always appropriate to have a harsh sound, depending on the type and size of group and instruments I’m playing with. In various types of yarn these might just fit my requirements. Thanks for the instructions! I wonder if you crocheted these in a wool that would felt and stuffed them with felting wool if they would work for dryer balls? Ooh, that’s an intriguing thought. I have no idea, but if you try it and it works, please let me know! I have done this and it works for the dryer. I also have wound wool yarn into balls and then rubber banded them and felted them. That works as well but you must check on them frequently to make sure they haven’t unwound.